• The final answer on Amelia Earhart: Amelia Earhart puts to rest the speculation and rumors surrounding Earhart’s disappearance. The Longs prove that she was pushing the limits of technology and simply pushed too far. With the primitive conditions Earhart was flying under—no radar, unreliable communication—she missed Howland Island, her next stop..
• An expert author and pilot: Elgen Long has more than forty years of combat and civilian flying experience. During World War II, he flew planes virtually identical to the Electra that Earhart flew, making him one of the few living pilots who understands the conditions she flew under. 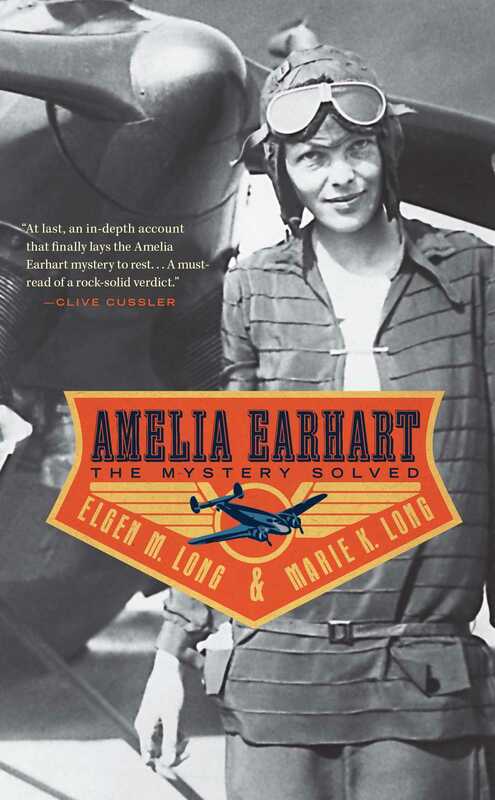 Elgen and his wife, Marie, spent more than twenty-five years, interviewed more than 100 witnesses, and traveled more than 100,000 miles researching this book. .
• A new movie: Amelia , starring Hilary Swank, will be released by Fox Searchlight in fall 2009. The screenplay is based on three books, including Elgen and Marie Long’s Amelia Earhart , and Elgen Long served as a technical advisor to the film..
Friday morning, July 2, 1937, Lae, New Guinea. It was not yet ten o'clock, but the tropical sun already beat down unmercifully on the twin-engine Lockheed Electra. Inside the closed cockpit, Amelia Earhart and her navigator, Fred Noonan, could feel the heat build as they taxied away from the Guinea Airways hangar. The heavily loaded plane lumbered slowly across the grassy airfield toward the far northwest corner. Soon they would take off southeastward toward the shoreline, to take advantage of a light breeze blowing off the water. When they reached the jungle growth at the end of the field, Earhart swung the plane around to line up with the runway for departure. Only 3,000 feet long, the grass runway ended abruptly where a bluff dropped off to meet the shark-infested waters of the Huon Gulf. Earhart was preparing to take off with the heaviest load of fuel she had ever carried. She and Noonan had flown 20,000 miles in the previous six weeks. Now only 7,000 miles of Pacific Ocean separated them from their starting point in California. The Electra, nearly 50 percent overloaded, was weighted to capacity with 1,100 gallons of fuel for the 18-hour flight to the next stop, Howland Island. Less than a mile wide, two miles long, and twenty feet high, their destination was just a speck of land that lay nearly isolated in the middle of the Pacific Ocean. It was truly a pioneering flight over a route never flown before, and they would be the first to land at the tiny island's new airfield. Two more firsts for the famous thirty-nine-year-old aviator, who upon reaching California would become the first woman pilot to have flown around the world. Fred Noonan, at age forty-four, was famous in his own right. As chief navigator for Pan American Airways he had navigated the Pan American Clippers on all their survey flights across the Pacific. Now, both he and his pilot knew that the grossly overloaded takeoff would put their lives at great risk. Fred watched closely as Amelia ran up each engine and checked it for proper operation. She gave the instruments a final scan, and they were ready to go. The moment of truth had arrived. Amelia advanced the engine throttles full forward and released the brakes. The roaring, straining airplane slowly accelerated as it began its ponderous takeoff roll. Her feet were busy on the rudder pedals, moving them left, right, back, and forward to keep the plane going straight down the runway. They passed the smoke bomb that marked the halfway point to the shoreline. The tail wheel was already off the ground; they were going over 60 mph. There was no stopping the heavy plane now; it was fly or die, and the bluff at the end of the runway was coming up fast. Amelia applied back pressure on the control wheel to lift off the ground. The force required was lighter than she expected, and the plane over-rotated slightly as the wheels left the runway. She relaxed some of the pressure, allowing the nose-high attitude to decrease slightly. They were off the ground, but their airspeed was too slow for optimum climb. When they were beyond the edge of the bluff, Amelia let the plane sink slowly until it was only five or six feet above the water. She signaled Fred to retract the landing gear, and the electric motor began cranking the wheels up into the nacelles to reduce drag. The seven seconds required to retract the landing gear seemed more like seven minutes as the engines struggled at full power to increase the airspeed. After several seconds, Amelia could tell that she needed less back pressure on the control wheel to hold the craft level. This signaled that the battle between the engines and the drag of the airplane was slowly being won by the engines. The airspeed was increasing; they were going to make it. When the indicated airspeed increased to optimum climb speed, Amelia let the plane rise from its dangerous position just over the water. After they were safely a couple hundred feet in the air, she gently turned the plane to a compass heading of 073 degrees, direct for Howland Island. She reduced the engines to climb power and quickly scanned the engine gauges to check that everything was normal. They breathed easier as the plane slowly rose to the recommended initial cruising altitude of 4,000 feet. Fred wrote down their takeoff time from Lae as 0000 Greenwich civil time (GCT), July 2, 1937. Having calculated that the flight to Howland Island would take 18 hours, they had to time their arrival to occur at daylight the following morning. Fred would need the stars to be visible for celestial navigation until just before they reached the island. Amelia had arranged for a message to be sent from Lae to notify the Coast Guard cutter Itasca at Howland Island of her departure. The 250-foot Lake class cutter was waiting just off the island to provide communications, radio direction-finding, weather observations, and ground servicing for her flight. The captain of the Itasca was to notify all other stations, including the U.S. Navy auxiliary tug Ontario. The Ontario was positioned approximately halfway between Lae and Howland Island, in order to provide weather reports and transmit radio homing signals for Earhart. Harry Balfour, the Guinea Airways radio operator at Lae, was receiving new wind forecasts for Earhart's flight just as she was taking off. The messages indicated that the headwinds to Howland Island would be much stronger than reported earlier, when they had expected only a 15 mph headwind. Fred had subtracted this headwind from the 157 mph optimum true airspeed to calculate a 142 mph ground speed. At 142 mph it would take them 18 hours to fly the 2,556 statute miles to Howland Island. Earhart's radio schedule with Lae called for her to transmit her messages at 18 minutes past each hour, and to listen for Lae to transmit its messages at 20 minutes after the hour. Balfour attempted to report the stronger headwinds to Earhart by radio at 10:20, 11:20, and 12:20 local time, but she never acknowledged having heard him. In addition, for more than 4 hours after she departed from Lae, local interference prevented signals sent by the plane from being intelligible until 0418 GCT. At 0418 GCT (2:18 p.m. local time), Balfour finally received a radio transmission from Earhart using the daytime frequency of 6210 kilocycles. She reported: "HEIGHT 7,000 FEET SPEED 140 KNOTS" and some remark concerning "LAE" then "EVERYTHING OKAY." At four hours and eighteen minutes into the flight they were already experiencing stronger headwinds than anticipated. The increased winds had made them recalculate their optimum speed. Amelia reported the change to 140 knots (161 mph) in her message. Maintaining the correct airspeed was important, but Earhart also had to fly at the correct altitude for optimum fuel efficiency. As the engines burned fuel, the plane's weight would decrease and the optimum altitude would increase. At any given aircraft weight there is a specific altitude for best fuel economy. The higher temperatures common in the tropics reduce the density of the air. Above the optimum altitude the temperature's effect on air density is equivalent to approximately a 2,000-foot increase in altitude and a corresponding increase in fuel consumption. The Electra would lose fuel efficiency below the optimum altitude but not nearly as rapidly as when flying above it. For maximum efficiency in the tropics, the Electra had to be flown approximately 2,000 feet below the recommended pressure altitude. Balfour heard the next report from Earhart in Lae one hour and one minute later, at 0519 GCT. She reported: "HEIGHT 10,000 FEET -- POSITION 150.7 EAST, 7.3 SOUTH -- CUMULUS CLOUDS -- EVERYTHING OKAY." Perhaps the cumulus clouds or the 9,000-foot mountains of Bougainville Island had forced them to the very uneconomical altitude of 10,000 feet. The worst had happened; they were flying at a density altitude close to 12,000 feet. The gross weight of the plane at this point would require them to burn an unconscionable amount of extra fuel to reach and cruise at that altitude. The resulting inefficiency could cost them a significant portion of their fuel reserve. The position indicated by the reported geographical coordinates, longitude 150.7 east and latitude 7.3 south, is less than 220 statute miles from Lae and well over 450 miles from where the Electra would have been at 0519 GCT. Since it was standard practice for ships at sea to give their position at noon every day, it's possible that this was their position at twelve noon local time. It definitely was not their position at 0519, when Earhart transmitted the message. Lae heard nothing from Earhart during her 0618 GCT transmitting schedule, but at 0718 GCT Balfour heard her report clearly on 6210 kilocycles: "POSITION 4.33 SOUTH, 159.7 EAST -- HEIGHT 8,000 FEET OVER CUMULUS CLOUDS -- WIND 23 KNOTS." At Nukumanu Island, Earhart and Noonan were approximately one-third of the way to Howland Island. They had been flying about six and a half hours and had a positive visual fix of their position. They knew their ground speed and the heavy plane's hourly fuel consumption precisely. None of the news was good. It would be prudent for them to reevaluate the remainder of their flight. Whether or not Earhart had heard the messages from Lae concerning the increased headwinds, she had already encountered the actual winds. She acknowledged their importance by reporting the 23-knot (26.5 mph) wind at 0718, and significantly she did not then, or ever again, end a message with her earlier sign-off, "Everything okay." So far, Earhart had maintained the optimum airspeed, but if the excessive fuel consumption continued they would arrive at Howland Island with little if any fuel remaining. The situation was very serious. If they were going to return to Lae, they had to turn about before they were beyond the point of safe return. A number of factors had to be weighed as Earhart made her decision to continue or return. The badly overloaded takeoff from Lae was punishing to the plane. The margin of safety had been so minimal that she would not want to expose them to it again unnecessarily. Even with a headwind it had required every bit of engine power that the plane could produce with 100-octane fuel, and there was no more 100-octane available at Lae. Earhart could not responsibly attempt another takeoff using only the 87-octane fuel that was available. A major delay would be caused by having to transport more 100-octane fuel to Lae. in the morning. There were no high peaks between Nukumanu Island and Howland Island, but there were the 9,000-foot peaks back on Bougainville Island between them and Lae. With their excess weight, if they lost an engine they might not be able to maintain altitude to clear the mountains. Lae was surrounded by mountains over 12,000 feet high on three sides, and near the airfield the terrain was over a thousand feet high. There were no landing or obstruction lights, so they could not land safely until daylight. Sunrise at Lae would be about 2020 GCT, nearly an hour and a half after they were due to arrive at Howland Island. No high terrain lay ahead, and if the weather cooperated they should be able to keep the plane operating optimally for the rest of the trip. They had now burned off enough fuel to be flying at comfortable weights. As Earhart continued toward Howland Island, she descended to 8,000 feet to get closer to the optimum altitude. It was still too high, but as they would not have to climb back up to it later, it was a reasonable choice. With better fuel economy and a tailwind replacing a headwind, they could safely return to Lae after 10 hours. They could not land back there before 2000 GCT anyway, so she could delay her decision until 1000 GCT. The sun had set about an hour before. It was dark as the Electra continued eastward toward Howland Island. On his map, Noonan could measure that at 0810 GCT they would be about 200 miles west of the Navy guard ship Ontario, which for over a week had been keeping near the midpoint position waiting for Earhart to pass. The coal-burning Navy auxiliary tug was not equipped with the high-frequency radio equipment needed to receive Earhart's transmissions on 3105 or 6210 kilocycles. The low-frequency radios on the ship prevented it from communicating with its base in American Samoa except at night. Earhart had requested by cablegram before takeoff that the Ontario send a series of Morse code "N's" at 10 minutes after each hour on 400 kilocycles. She wanted to be able to take radio bearings on the ship with her radio direction-finder as they flew by. If she listened to her Bendix radio receiver for the "N's" at 10 minutes after the hour, she heard nothing. At 0815 GCT, Earhart was scheduled to transmit a quarter-after-the-hour report on the nighttime frequency of 3105 kilocycles to the Coast Guard cutter Itasca, waiting just offshore at Howland Island. Neither the Itasca nor Balfour back at Lae heard anything. This was not surprising, as both were over a thousand miles away, and her Western Electric transmitter was rated at only 50 watts. At 0910 GCT she may have listened again for "N's" on 400 kilocycles, because at a ground speed of 134.5 mph she would be passing by the ship just before 0940 GCT. She must have been disappointed when she did not receive any of the scheduled signals from the Ontario. She had no way of knowing that her departure message from Lae had been delayed. The Ontario never logged sending "N's" on 400, and soon after 1500 GCT set course to return to American Samoa. The tug was running short of coal. Earhart and Noonan were past the Ontario and more than halfway to Howland Island by 1000 GCT. They were approaching the point of safe return, and it was time to reevaluate their progress. They decided not to return to Lae and committed themselves to continue. There was no known airfield within a thousand miles of Howland Island. From that moment on, if Earhart was to successfully complete the flight around the world, a landing at Howland's airfield was mandatory. There was no alternative. It was coming up on 1030 GCT when Earhart saw lights on the ocean ahead. As the lights came closer she could see that it was a ship and transmitted a report of the event. It was about 1030 GCT when she reported "a ship in sight ahead." The ship SS Myrtlebank, with Capt. Cort J. Holbrook in command, was out of Auckland, New Zealand, bound for Nauru Island. The 434-foot cargo ship of the Banks Line Ltd. was under charter to the British Phosphate Company and due to arrive at Nauru Island at dawn. The Myrtlebank's estimated position at 1030 GCT was 80 miles southward of Nauru. Harold J. Barnes, officer in charge of the radio station at Nauru Island, copied Earhart's message. He called her over Nauru's radio station VKT on 3105 kc. The Itasca heard VKT, but evidently Earhart did not. From Lae to the Myrtlebank's 1030 position was approximately 1,414 statute miles. It had taken Earhart 101/2 hours to get there, at an average ground speed of about 134.5 mph. There were 1,142 statute miles still ahead to their destination. If they continued at the same speed, it would take them 81/2 hours to get to Howland Island. Their new estimated arrival time would be about 1900 GCT, nearly an hour after the stars had disappeared. It was overcast as they approached the Gilbert Islands. At 1415 GCT, Earhart transmitted her quarter-after-the-hour radio message on 3105 kilocycles. When the plane passed high overhead in the cloudy sky, the local time in the British-administered Gilberts was after two in the morning. Amelia and Fred were now only 4 hours from Howland Island. Though the headwind had not slackened, they had been able to come reasonably close to keeping their fuel consumption on target. The 26.5 mph headwind had necessitated holding their true airspeed at 160.5 mph for maximum range. The higher-than-planned airspeed automatically increased their fuel consumption, but they were still progressing the same optimum number of miles over the ground for each pound of fuel burned. They were burning 8.5 percent more fuel each hour to do it but at the same time were progressing 8.5 percent more miles toward their destination each hour. With only four more hours to go, the specter of running out of fuel before reaching Howland Island was greatly diminished. They could rationalize that it would not be considered unusual, or even improper, for a pilot to fly a 4-hour visual flight in the United States and land with only a 45-minute fuel reserve. But of course this was not a visual domestic flight. At 1515 GCT, Amelia turned on her transmitter and sent the following message: "ITASCA FROM EARHART -- ITASCA FROM EARHART -- OVERCAST -- WILL LISTEN ON HOUR AND HALF HOUR ON 3105 -- WILL LISTEN ON HOUR AND HALF HOUR ON 3105." They would leave the Gilbert Islands before their next quarter-after-the-hour transmission, and the sky was still overcast. A positive visual fix from the island would be possible only if the clouds cooperated. They still had over three and a half hours to go, and Fred could calculate that the sun would rise just before 1800 GCT. That would be shortly after they crossed the international date line, at 180 degrees longitude. Nautical twilight would begin 49 minutes before sunrise. It was imperative that he get a celestial fix before daylight obscured his view of the stars. At 1615 GCT the sky was only partly cloudy and Fred could presumably see stars for a celestial fix. Standard procedure was for Amelia to take the plane off the automatic pilot and hold it as level as possible while Fred took a series of sightings with his octant. By 1622 GCT he would have had time to finish his observations, and Amelia could turn control back to the Sperry autopilot. It was already past the time for her quarter-after-the-hour transmission. Eight minutes late, at 1623 GCT, she transmitted a report in which the Itasca heard her say it was "partly cloudy." As long as it remained partly cloudy, daylight would not obscure the stars for at least another hour. Fred could readily take additional celestial fixes if he needed or wanted them. A celestial fix at 1622 GCT would have shown them to be about 354 miles from Howland Island. The wind was slowing their ground speed to 133 mph. If Earhart could get radio bearings from the Itasca, they could continue straight toward the island following the courses indicated by the radio bearings. If they flew straight in, their estimated time of arrival would be about 1902 GCT. If no radio bearings were received to guide them, Noonan would have to depend on something else to set an accurate final course for the island. They were flying an easterly course, and the morning sun would rise right in front of the plane. A sun line, or single line of position from the sun, plotted on Noonan's chart would be at right angles to the sun. The sun line would lie on his chart running approximately northward and southward across their course to Howland. The sun line would accurately update their position along the course to the east and west, but it could provide little indication whether they were maintaining the intended course direct to the island or actually flying off to the north or south of it. Their arrival time at the island was not crucial, but it was imperative they not accidentally fly past the island to the north or south without seeing it. The standard solution to this problem was for Noonan to make a judgment of the maximum distance it was reasonable for them to be accidentally off to the north or south of his intended course. (In navigation, this is called the area of uncertainty.) Noonan would then make a deliberate choice, north or south, to head the airplane off the distance of his uncertainty to one side. He would then know beyond a reasonable doubt that his actual position was off to the north or to the south side of the island, whichever he had chosen. When the sun line of position indicated they had progressed eastward as far as Howland Island, he would turn in the appropriate direction (northward or southward, depending on which side he had chosen) and fly directly toward the island. This was a standard procedure that Noonan had used many times. This effectively eliminated any course errors they might have accumulated since the 1622 GCT (or any later) celestial fix. It would give them a relatively accurate fresh start on the final course line as they approached the island. Meanwhile, to ascertain that they were off to the north or south side of the island would require them to fly an extra 15 or 20 miles, delaying their arrival time 8 or 10 minutes to about 1912 GCT. It was approximately 1715 GCT when the last fuselage tank ran empty. Amelia switched the selector valves to run the engines off the last main wing tank, which was still full with 97 gallons. The design of the fuel system required her always to run both engines off the same tank. The engines were each burning about 20 gallons per hour. At a total of 40 gph, the tank would run dry in slightly less than 21/2 hours, or at approximately 1945 GCT. Amelia would select the stripper pump and carefully pump out by hand any fuel left by the engine pumps in the fuselage tank. This transferred every remaining drop into the last main wing tank and assured that all the gas left on the airplane was in that one tank. When it ran dry, they would be completely out of fuel. The eastern sky was getting lighter, heralding the coming sunrise. The calculations from the celestial fix would have them 200 miles out of Howland at 1732 GCT and 100 miles out at 1817 GCT. They were now approaching the island, and Amelia still hadn't heard from the Itasca. Before the flight she had cabled the Itasca that she would transmit by voice on 3105 kilocycles as she approached. She had also told them she would broadcast at a quarter to the hour when she could. The Itasca transcribed Earhart's 1744 GCT message and information as follows: "WANTS BEARING ON 3105 KCS/ON HOUR/WILL WHISTLE IN MIC." She gave them a moment so they would be ready to take the radio bearing, then transmitted at 1745 GCT: "ABOUT TWO HUNDRED MILES OUT//APPX//WHISTLING//NW." A few minutes later Amelia would need her darkest sunglasses. The sun, coming up in the front of the plane, would shine directly into her eyes through the cockpit windshield. Amelia was expected to listen at 1800 GCT for the Itasca to transmit during her on-the-hour listening schedule. She would select band 4 on the Bendix receiver and set the dial to 3105 kilocycles. When receiving signals she would turn the CW (code) switch off and listen intently for a voice on 3105 kilocycles to tell her the radio bearing, as she had requested. The volume would be set high as she searched both sides of the 3105 dial, reading for any voice signal. There was nothing but noise and static, and after listening for a few minutes she could only tell Fred there was no bearing from the ship. The only thing she could do was try again during her quarter-after-the-hour transmitting schedule. Fred had his octant in the cockpit so he could sight the sun through the windshield. They must shortly begin their descent to below the clouds. He had to take his sightings before they started down. At 1815 GCT, it was time for Amelia to transmit on the quarter-after-the-hour schedule. If the Itasca hadn't heard her before, she was hopeful they would get a bearing on her now. She sent the following: "PLEASE TAKE BEARING ON US AND REPORT IN HALF HOUR/I WILL MAKE NOISE IN MICROPHONE -- ABOUT 100 MILES OUT." When Amelia was finished, Fred needed her to hold the plane steady while he took a series of sights of the sun with his octant. He would be finished by 1825 GCT. The sun was about 7 degrees above the horizon, and he would calculate its azimuth (direction) to be 067 degrees. Fred had completed his sightings, and Amelia put the plane back on autopilot. They needed the bearing she had requested from the ship, and she listened intently at 1830 GCT. Once again, there was nothing but noise and static. She hadn't received any voice signals from the Itasca during either the 1800 or the 1830 GCT schedule. Either the Itasca wasn't transmitting to her with voice at that time, or her receiver wasn't receiving the signals. As far as she knew it was possible the Itasca's 3105 transmitter wasn't working, and they were transmitting on 7500 kilocycles instead. She had no way of knowing what was wrong. In order to use the 1825 GCT sun line as a guiding course for coming in to Howland Island, Noonan would draw on his map a new advanced parallel line 157-337 that ran right through the island. He could then measure the distance between the 1825 GCT line and the new advanced line, along the eastward course they were flying. It was 82 miles from the original plotted 1825 GCT sun line to the new advanced line that ran through Howland. Noonan could then calculate that at a ground speed of 133 mph, it would take 37 minutes to fly the 82 miles. He would tell Earhart to turn toward the island at 1902 GCT, exactly 37 minutes after 1825. She would turn to fly a heading calculated to keep them on the new advanced course line, 157-337, until they saw the island. Earhart started to descend at about 1833 GCT, when they were approximately 65 miles out of Howland Island. They needed to be below the cloud base before their estimated arrival time. They must not accidentally go past the island while it was hidden under clouds. They had received no radio bearings for guidance, so Noonan had to change the compass heading to make sure they were far enough off to one side of the island to cover any uncertainty when they intercepted the new advanced line, 157-337 degrees, at 1902 GCT. Earhart could reduce the power by pulling back on the throttles as the plane gained speed in the descent. The fuel flows would drop in unison as the power was reduced. As long as the engines didn't quit or run rough, she could continue to let them run with lean fuel mixture. She would want to do everything possible to conserve fuel. If she selected the main wing fuel tank gauge, it should have read slightly over half full. As the plane continued to descend, the relatively cool, dry air in the cockpit at the higher altitudes would have slowly given way to the warm, moist air normal on the surface at the equator. At 1,000 feet they were below the cloud base, and Noonan and Earhart could look carefully in all directions to try to spot the island. They were approaching the turning point and were busy searching every quadrant of the empty sea below. There were no whitecaps on the surface. That would indicate that the 26.5 mph headwind they had bucked since leaving Lae had finally died down. Without a smoke bomb they could not determine the wind's actual direction or velocity; they just knew that without whitecaps on the water, it was blowing less than 12 mph. At about 1902 GCT Earhart turned toward Howland Island and flew a heading to maintain a course on the new advanced 157-337 line of position. Noonan's standard procedure would put the island about 15 or 20 miles dead ahead. They searched the water in front of them and to either side for any sign of the island or the cutter Itasca. The atmospheric visibility was good, and they could effectively search the ocean's surface for the island except when they looked toward the morning sun. The sun was only 17 degrees above the horizon, and it created a glare off the water. It was difficult to see anything in that direction. Also, the shiny aluminum surfaces of the wings and engine nacelles acted like mirrors. The sun's rays were reflected off the metal into their eyes, further hampering their vision toward the east. The ten minutes Fred had estimated to get to Howland Island had elapsed, and there was still nothing in sight. At 1912 GCT Amelia made her quarter-after-the-hour transmission. While they continued to look out over the water for Howland Island, she reported on 3105 kilocycles, "KHAQQ CALLING ITASCA WE MUST BE ON YOU BUT CANNOT SEE YOU BUT GAS IS RUNNING LOW BEEN UNABLE REACH YOU BY RADIO WE ARE FLYING AT ALTITUDE 1000 FEET." Earhart probably chose to pull the propellers back to minimum rpm, then advance the throttles just enough to keep the indicated airspeed around 85 mph for maximum endurance. They needed time to look for the island. By maintaining maximum endurance airspeed they would burn the least fuel per hour. They continued onward for 16 more minutes and by 1928 GCT had flown along the new line 157-337 for a total of about 40 miles. When they had first started to fly along the line at 1902 GCT, they could have scanned 20 miles in the opposite direction before turning onto the line. Now they could see 20 miles farther ahead. Altogether, they had visually searched about 80 miles on the new advanced line of position. Howland Island wasn't there. As the navigator, Fred had the knowledge and insight to judge just how accurate their position was at that moment. This was not a judgment he would make lightly, as their lives so clearly depended on it. By 1928 GCT he must have been sure they had already passed to the east or west of Howland Island. He judged the island must now be behind them, and had Amelia begin circling so they would not fly farther away. They must get a radio direction-finder bearing to resolve whether the island was to the east or west. Amelia had already tried twice, without success, to get the Itasca to report a bearing to her by using voice on 3105 kilocycles. She set the receiver to band 5, set the dial on 7500 kilocycles, and turned the CW switch on. She was going to try a different strategy. Two minutes before the Itasca's scheduled time to transmit on the half hour, she transmitted on 3105 kilocycles, at 1928 GCT: "KHAQQ CALLING ITASCA -- WE ARE CIRCLING BUT CANNOT HEAR YOU GO AHEAD ON 7500 EITHER NOW OR ON THE SCHEDULE TIME ON HALF HOUR." Amelia had turned on the receiver's CW (code) switch to activate the receiver's beat frequency oscillator, so she could receive the agreed-upon "A's" in Morse code on 7500 kilocycles instead of the voice transmissions she had listened for on 3105 kc. Soon there were loud Morse code dit-dahs of "A's" being repeated over and over. She adjusted her radio direction-finder's loop coupler to make sure it was selected to band 5, and tuned the "A's" for their loudest reception. Then she switched to take a bearing, and turned the loop to find the direction the signals were coming from. The "A's" signal volume should have weakened and dropped off to minimum strength when the loop was turned across the direction the signal was coming from. Amelia turned the loop completely around, but there was no point where the signal "A's" signal volume would drop off. She couldn't get a minimum on the Itasca's signal anywhere. Finally the "A's" stopped, and Amelia could hear Morse code sending something for a few seconds. Then silence. She picked up the microphone and at 1930 GCT said: "KHAQQ CALLING ITASCA WE RECEIVED YOUR SIGNALS BUT UNABLE TO GET A MINIMUM PLEASE TAKE BEARING ON US AND ANSWER 3105 WITH VOICE." And then she made long dashes for them to take a bearing on. Amelia cranked the receiver back to band 4 and set the dial to 3105 kilocycles. She turned the CW switch off and listened for the Itasca to answer with speech as she had requested. There was nothing but noise and static on 3105. She gave it up after a few minutes and resumed looking for the island. If she activated the hydrostatic fuel gauge, it would now indicate less than a quarter tank of fuel remaining. Amelia was undoubtedly feeling increased tension in her muscles. They had saved an additional half hour's worth of fuel by descending and flying at endurance airspeed, but that would be the last of it. They had 35 to 40 minutes to find the island and must choose the option that would give them the best chance in the time allotted. Noonan could be certain that his navigation had placed them within 50 miles of the island to the north or south, and within 20 miles to the east or west. They had already searched the advanced line of position to the north and south without seeing any sign of either the Itasca or Howland. They obviously had passed to the east or west of the island, but without a radio bearing they could not determine which. Regardless of whether they chose to move over to the east or contrarily to the west, they had only a fifty-fifty chance of being correct. It would take over 30 minutes to search the selected side, leaving not enough fuel even to get to the other side. If they'd had an hour and 15 minutes' worth, they could have covered both the east and the west sides and solved their dilemma. With a couple hours' fuel reserve, Noonan could even have started a square search pattern to look for the island in all directions. But they had only 35 or 40 minutes of fuel remaining. They had to make a decision. Reasonable error placed the advanced 157-337 line of position within 20 miles of Howland to the east or west, but there was a good chance they were even closer. They decided to retrace their flight along the 157-337 line and visually search the ocean on both sides of the plane with renewed vigor. There was still one more chance, on the hour at 2000 GCT, for the Itasca to give them a radio bearing with voice on 3105 kc. It was important they remain as close to the island as possible. If they did get a radio bearing, there was little time left to follow it into the island. The last chance for Amelia to turn on the Bendix receiver and listen for the Itasca to transmit on 3105 with voice came at 2000 GCT. Unfortunately there was nothing but noise and static, no voice signal from the Itasca to give them a radio bearing. She returned to searching for any sign of the island on the ocean. Their last hope for a bearing was gone, and she could only hope that the island might miraculously appear in the few remaining minutes. Her body would react to the anxiety, and the adrenaline would flow to prepare for the impending emergency. The other tanks had been stripped, and the last main wing tank was now showing empty. Amelia turned on the Western Electric transmitter for a final call. She decided there was no hope for a radio bearing now. Meanwhile, two hours had passed since sunrise. Her agreement had been to use 3105 kilocycles, but this time she would repeat the message on the daytime frequency of 6210 kilocycles just in case something was wrong with 3105. At 2013 GCT, with her voice pitched noticeably higher from the tension in her throat, Amelia spoke rapidly, transmitting the following on 3105: "WE ARE ON THE LINE OF POSITION 157-337, WILL REPEAT THIS MESSAGE, WE WILL REPEAT THIS MESSAGE ON 6210 KCS. WAIT LISTENING ON 6210 KCS....WE ARE RUNNING NORTH AND SOUTH." Amelia released the microphone button. She leaned over to crank the transmitter control from 3105 kilocycles to 6210. When the engines began to surge, she would have to drop the microphone and use both hands to reach for the control wheel and disengage the autopilot. For a few seconds, the engines cutting in and out would cause the plane to yaw back and forth. Finally, the engines would quit completely. To follow standard procedure Amelia would lower the nose to maintain a safe gliding speed, and configure the plane for ditching in the water. She would put the flaps full down and leave the landing gear retracted. With the drag of full flaps and the windmilling propellers, she would have to lower the nose considerably to maintain safe airspeed. The plane's rate of descent would increase accordingly. The stall speed of an empty Electra with full flaps would be less than 60 mph. When the aircraft neared the water, Amelia would have to time precisely the critical raising of the plane's nose to stop the rapid descent. If she leveled off too high or too early, the plane could stall and she might lose control before it hit the water. If she was too low or too late when she leveled off, the plane could hit the water too fast. The dead-stick ditching of a plane into the ocean wasn't something you could practice; you had to get it right the first time. As they approached the water, Fred could have rationalized his inability to find the island as plain bad luck. He had navigated other flights that had taken longer. The distance from Lae to Howland wasn't much farther than earlier pioneering flights he had made with Pan American Airways. As far as navigation was concerned, the course from Lae was neither particularly difficult nor extraordinary. Except for the absence of radio navigation and communications at Howland Island, the flight was little different from dozens he had made before. They had known from the start that it might require radio direction-finding to bring them in and had provided two systems in case one failed. Regardless, with a normal fuel reserve they could have searched the area to the east and west of Howland, or used a standard square search pattern to find the island. Beyond all reasonable odds, the random hand of fate seemed to have conspired against them completely. Why couldn't Amelia get a minimum with her Bendix radio direction-finder? Why couldn't she hear the Itasca transmitting voice on 3105 kilocycles? Why hadn't they seen smoke rising from the Itasca? Why was Noonan's navigation so far off that they missed the island entirely? Whatever the causes, they were directly responsible for the failure of the flight. Amelia had been apprehensive during the last 12 hours of the flight that everything was not okay. After all of the careful planning, how could everything have gone so wrong? There was little time for reflection as the aircraft, now strangely almost silent, glided toward the sea. A couple of minutes after the engines quit, Amelia Earhart was flaring the plane above the reasonably placid waters of the Pacific Ocean, somewhere near Howland Island. She had worked and sacrificed for years to gain recognition of women's abilities. The flight had been designed to demonstrate to a skeptical world the contributions women were capable of making. History would be charged to record her effort honestly and determine if it had been truly worthwhile. Earhart could only hope that from this moment of failure, she would be vindicated for daring to lead the way. But what demonic trick of fate had caused this tragedy? Elgen M. Long is a retired Boeing 747 captain with more than 40,000 hours of worldwide airline flying spanning 50 years as a radioman and navigator, including over 100 U.S. Navy combat missions during World War II, and patrols over Howland Island, where Amelia Earhart disappeared. He is the holder of 15 world records and/or firsts, most notably as the first person to fly around the world solo, touching down on seven continents and flying over both the North and South Poles, in 1971. Mr. Long lives in Reno, Nevada. Marie K. Long, a former public relations consultant with the Western Aerospace Museum (now the Oakland Aviation Museum) in Oakland, CA., and wife of Elgen Long, passed away in 2003. Mary S. Lovell author of The Sound of Wings: The Life of Amelia Earhart This book will be indispensable to Earhart scholars and anyone interested in her story. It is based on solid research...the best study -- by far -- on this subject....In my own Earhart biography, I stated that if the Earhart mystery was ever to be cleared up, the Longs were the people most likely to do the clearing. Clive Cussler At last, an in-depth account that finally lays the Amelia Earhart mystery to rest. Elgen and Marie Long lead us through the final flight and prove conclusively that Earhart and Noonan simply missed Howland Island, ran out of fuel, and set down in the sea. A must-read of a rock-solid verdict. Reeve Lindbergh author of Under a Wing The quiet expertise and painstaking intelligence of this book are a tribute to all aviators and a real gift to aviation history. Walter Boyne former director, National Air and Space Museum Amelia Earhart: The Mystery Solved is a turner. With compelling evidence in hand, Elgen and Marie Long demonstrate their mastery of the Earhart story, navigational technique, and pure logic to show the tragic reason for her loss and to offer the hope that her plane can be found. An utterly fascinating account of one of modern aviation's most famous mysteries.